A Supplement to Peninsula Pioneer Revisited is now available as a free PDF download. The supplement contains some additional historical information which has come to light since the book was published, along with some updates to current operations and additional new photos. Download the Supplement here (9.3 Mb). This website is evolving as a reference site for the various railways and tramways on Eyre Peninsula. 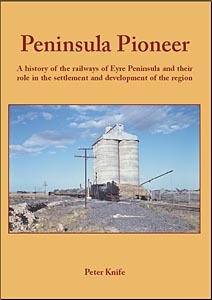 It contains some information extracted from Peninsula Pioneer, and additional information not included in the book. 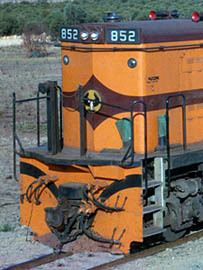 The author's related Minnipa (SAR Port Lincoln Division) website specifically covers the railway at Minnipa and the author's model railway which is a historically-based representation of Minnipa in the 1960s. 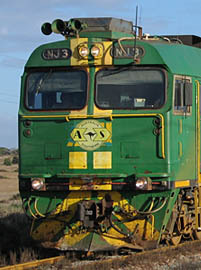 After over 111 years, grain train operations on Eyre Peninsula will come to an end on 31 May 2019. Viterra and GWA have been unable to agree on a new contract, with Viterra choosing to switch to road haulage. As a consequence, almost all of the former SAR Port Lincoln Division will be shut down. The only exception will be the Thevenard-Kevin gypsum line, where services will continue. 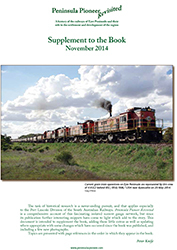 Up-to-date details of grain train operations in the final months can be found in the 'Eyre Peninsula Rail Enthusiasts' group on Facebook. Peninsula Pioneer Revisited, released in May 2013, is an updated and expanded version of the definitive history book Peninsula Pioneer. 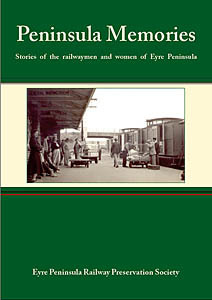 The companion volume Peninsula Memories, released in 2007, is a collection of stories by and about the railwaymen and women of Eyre Peninsula. The original Peninsula Pioneer (published April 2006) is now out of print. Full details: Peninsula Pioneer Revisited - Peninsula Memories - Peninsula Pioneer. 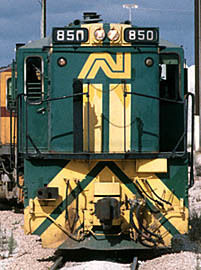 The various faces of the operators of the Port Lincoln lines over the years. 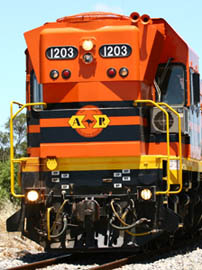 From the left, South Australian Railways (1907-1978), Australian National (1978-1997), Australia Southern Railroad (1997-2002), Australian Railroad Group (2002-2006) and Genessee & Wyoming Australia (2006 to date). Photos: Bill Lewis, Peter Knife, Greg O'Brien, Richard Montgomery, Peter Knife. The Port Lincoln Division was built to open up the inland areas of Eyre Peninsula for agriculture. The lines were pushed into virgin bushland which was devoid of established settlements, and the people followed. The towns which now dot the landscape along the line were built because of the railway - only Port Lincoln, Ceduna and Penong pre-dated the coming of the railway. In this sense the railway was a true pioneer. The railway was also built to what is known as 'pioneer' standard - second-hand rails, little or no ballast, and following the surface of the land. The title is indeed apt. Chris Carpenter has put together this video which combines scenes from the Port Lincoln Railway Centenary in 2007 with some footage of operations on Lower Eyre Peninsula.